Working against specific, defined problems, OXL sources potentially transformative ideas through partnerships with a network of makerspaces, universities, and industry labs; our own engineering research and development; and crowdsourcing ideas through the Digital Makerspace, mass collaboration events, prizes and challenges, design sprints, and hacks. These events generate new ideas for innovations and invite new entrants as part of a global community of creative solvers working to address ocean conservation challenges. The Blue Economy Challenge: The Blue Economy Challenge, launched in February 2016 by Conservation X Labs, SecondMuse, WWF, and the Australian Government, was a $2.5 million-dollar global competition for transformative innovations in aquaculture. The Challenge received applications from 221 innovations from 41 countries and identified cutting edge innovations around sustainable feed for farmed fish; novel aquaculture system designs; and creation of new ocean products for human consumption and use. The Make for the Planet: Over the April 21 – 23, 2017 weekend, Conservation X Labs hosted Make for the Planet in partnership with the Smithsonian Institution's Earth Optimism Summit, WWF, Nation of Makers, HacDC, and Duke Conservation Technology. This was a conservation challenge competition to create hardware and software solutions. The competition hosted 16 teams responding to 5 specific conservation challenges. Two of the challenges were oceans themed, including preventing plastic from becoming marine debris and addressing waste and market inefficiencies in over-fishing. This event was generously supported by the Moore Foundation, Schmitt Marine Technology Partners, and the Richard Lounsbery Foundation. Collaborate. The Digital Makerspace is designed to create communities of practice and connect community members to oceans conservation projects, and help project managers and instigators solicit and identify technical, financial, and human resources. Incubate. 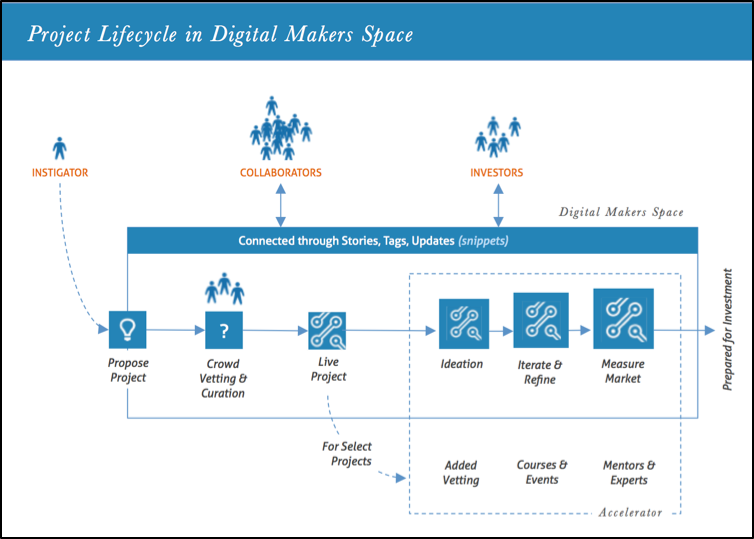 The Digital Makerspace helps innovators improve the benchmarks of their projects from the initial vetting and screening of a project idea to follow-on phase gates that support project progress and set standards and criteria for different phases of development. Innovators have a roadmap and a way to monitor their progress. Innovate. The Digital Makerspace’s creates a new pipeline of innovations for conservation by recognizing that innovation happens at the boundaries between disciplines. By creating a platform that helps bring together different disciplinary expertise and knowledge, we help accelerate the development of new breakthroughs. We seed this collaboration and generation of new innovations via sponsored challenges and prizes, open problem statements, ideation processes, and scanning for opportunities to transform existing technologies and approaches. The Oceans X Labs Accelerator takes the best innovations sourced and prototyped on the Digital Makerspace, including those we bring to the platform as the result of a challenge, and accelerate them to achieve market-readiness and ready for commercialization by connecting them with underlying demand. In July 2017, we will welcome the first cohort of the Oceans X Labs Accelerator, an enterprise development program tailored and dedicated to the success of innovators in the ocean conservation space. The accelerator programming will focus on customer development, business planning, technology transfer, and science and innovation in start-ups as well as capitalize on a peer-to-peer learning model and personalized mentoring from industry experts. The accelerator program will largely be convened digitally and take advantage of the Digital Makerspace resources, platform, and community. The best accelerators involve programmatic tools and resources, a robust community of fellow innovators at different stages, and access to mentors and finance. The Digital Makerspace will be a continued resource for our innovators who move into the accelerator program, where they can seek feedback on strategies, identify resources, and connect with investors, but we highlight two other important components of the Accelerator program: Mentoring and Programming. Mentoring: Our mentoring program transforms ideas into true conservation impact. We will access assistance and attention from our global team of mentors in industry, technology, and conservation specific to each innovator’s needs. Through our Digital Makerspace, virtual office hours, demo days and digital events, we will help innovators directly interface with seed funding opportunities, technical expertise, knowledge exchanges, and crowdfunding assistance. Through digital and in-person boot camps, we will assemble and recruit a cross-disciplinary technical “Council of Experts” to provide real-time feedback on technical and strategic issues for each innovator, and make commitments to help an innovator address his or her core challenges. Programming: Through the Digital Makerspace, as well as open courseware developed by Oceans X Labs, we will work with entrepreneurs to ensure that their innovation meets market demand. In partnership with Duke University Innovation & Entrepreneurship Initiative, we will help innovators develop clear and compelling value propositions, understand investment landscapes, and select appropriate management structures and boards. We will provide them with assistance in opportunity assessment, growth planning, customer engagement, finance, and legal compliance. Oceans X Labs will harness the storytelling capacity of its partners to help innovators use narrative structure and media productions to craft sharable, impactful, and narrative driven pitches. The programming will be tailored around the stage of the company (early versus late). Global impact requires scale. We devote significant attention and effort to scale the most impactful ideas and enterprises with support from the community of global innovators for conservation that we will be building, as well as from conservation NGOs, bilateral and multilateral donors, philanthropy, and—most importantly—through each innovation/enterprises’ own profitability and attractiveness to the private sector. We provided tailored support to our innovators – to help them meet their business goals as well as achieve conservation impact.